As adults, we often take simple things in life for granted. One example of this is being able to tie our own shoes. Now it seems like second nature, so easy to do. However, I still remember trying to learn to tie my shoes when I was little. My mother tried everything to assist me, but nothing worked. That was until my best friend from across the street came over. She taught me to make two "bunny ears" and voila . . . my shoes were tied. My oldest son, NHL, is five years old. As he has grown up, we have predominantly bought him shoes that have velcro on them. Some of this was for the pure ease of it, another was to allow him to be more independent. NHL has low muscle tone. Due to this his fine motor skills are not quite up to par. With occupational therapy, he has gained a lot of skills, especially in writing. Recently I wrote a note to NHL’s therapist asking her about tips to help him tie his own shoes. She sent some great poems to use with him. Still, I had no real idea of how to assist him. Each time I tried to show the "bunny ear" approach it was just too much for NHL to do. Thanks to The Family Review Network, I had the opportunity to try a product called Tie BuddiesTM . Tying your shoes is a small but essential skill, one you use for the rest of your life. Help your little one learn faster with Tie BuddiesTM. These cute, kid-friendly devices act as easy pull-tabs for small hands, taking messy loops out of the equation. The happy characters make a game of it, resulting in a strong knot and even stronger recall. about from wanting to give my daughters independence, build their confidence and have fun learning. By eliminating loops, Tie Buddies® eliminate the confusion of multiple "holes" where the laces can pass through. There is no other product that stays on the child’s shoe giving them independence while re-enforcing the learning process. 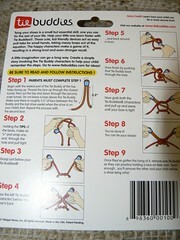 Instructions to assist your child with a story to tie their laces in eight steps are included on the back of the Tie Buddies. 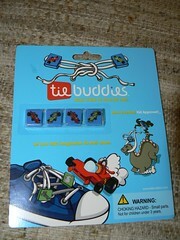 A demonstration of Tie Buddies is available on their website. Each package includes four Tie Buddies at $7.95 for one pair of shoes. Patent is pending on the design for this shoe tying tool. NHL has been very reluctant to learn to tie his shoes. He would rather not spend the time and gets easily frustrated. When I heard about Tie Buddies, I asked NHL’s Occupational Therapist about them. She told me that she had been hearing a lot about them, but had never actually tried them. We were intrigued and hoped that they would assist NHL with this milestone. When the package arrived, NHL was very excited to see what they were. I was able to place the Tie Buddies on his shoelaces with no problem. Then it was time to test them out. I modeled on one shoe as he followed along. Unlike previous attempts to learn how to tie his laces, he did not scream and yell. He was genuinely interested in what the Tie Buddies would do. He was able to easily grasp them and with practice has been getting much better with them. NHL was shy and would not allow me to take his photos while working with this. He really seemed to like the fact that the Tie Buddies made things so much easier with the "bunny ear" formation. He did not have to do too many steps and can follow along. With more practice, he will likely be able to add this to his milestones. It will probably be a little time before we will be able to take the Tie Buddies off, since they honestly do assist him so much. We will definitely be recommending these to all of NHL’s kindergarten friends that are still learning to tie shoes. They take the guess work out of the process for the parent, and make it a fun experience for the kids. Thanks to Tie Buddies, 1 lucky winner (US Residents only) will have a chance to win their own package of Tie Buddies. MAIN RULE – Visit the Tie Buddies website and then come back and leave a comment telling me which set you would prefer and who they would be for. 1 Bonus Entry – Follow me on Twitter @TheAngelForever and tweet about the giveaway. Be sure to include @TheAngelForever and Tie Buddies in the Tweet. Please leave a direct link to your Tweet in a separate comment. To enter, just follow the rules above within the comment section. Be sure that I have an e-mail address that I can contact you for a mailing address once the giveaway is over. All entries must be received by 10:59pm EST on April 15, 2009. I will pick the winner using random.org and contact you via e-mail. You will have 48 hours to claim the prize. If no response, another winner will be selected. I like the Red and Green Race Cars. These would be for my 5 year old son Zander. Thanks. I remember the shoelace tying event…seems like yesterday! I like the fairy and magic wand for my niece! The race cars would be a big hit in my house. I am currently working with my daughter on this skill. This would be perfect timing to win this right now. THANKS!! I’d like the race car set for my six year old. I’m hopeless at teaching him. I’d choose the Race Car set for my 4 year old son! Then pass it on to my other 2 kids when they’re ready. Thanks! You know my little car freak would LOVE the cars-he’s been trying to tie his shoes lately…so these would be absolutely awesome for him! Laura’s last blog post..Game Geeks-Really? Definitely the race cars, and I don’t have to tell you who they’re for! We tried once to teach Alex to tie shoes and it didn’t last long. I’ll be happy to get away from the Vel-cro shoes once he knows how to tie his own! Thanks to everyone that entered this giveaway. It is now closed and the winner will be notified.